Ottoville’s Nick Moorman puts up a shot against Pandora-Gilboa’s Drew Johnson during Saturday night’s game at Pandora-Gilboa. 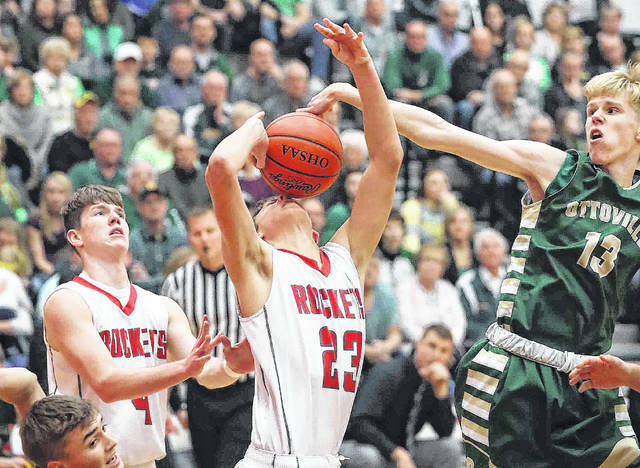 Ottoville’s Ryan Suever blocks the shot of Pandora-Gilboa’s Cole Schwab (23) during Saturday night’s game at Pandora-Gilboa. PANDORA — Pandora-Gilboa’s all-time leading scorer Drew Johnson was on the bench with early foul trouble. So all the Rockets did was play swarming man defense and get plenty of contributions besides Johnson. P-G erased a three-point halftime deficit to post a 59-51 boys basketball victory over Ottoville in a Putnam County League boys basketball game Saturday at P-G. The game was played before a packed-in crowd of 1,500. Ottoville led 22-19 at the break, with Johnson sitting out the final 7:36 of the second quarter with his second foul. The Rockets then came out and outscored the Big Green 19-6 in the third to pull out to a 38-28 lead. P-G guard Cooper McCullough had 18 points with three 3-pointers to lead the Rockets. Johnson finished with 13 points and four rebounds. Johnson fouled out with 1:48 to go. “Drew was feeling a little sick this morning and we knew we had to pick it up,” McCullough said. P-G guard Jared Breece had 12 points, all in the second half. Many came on drives to the rim. Riley Larcum had seven points and 12 rebounds. He also did a good job holding Big Green freshman shooter Josh Thorbahn to 11 points, including three NBA-like 3-pointers. 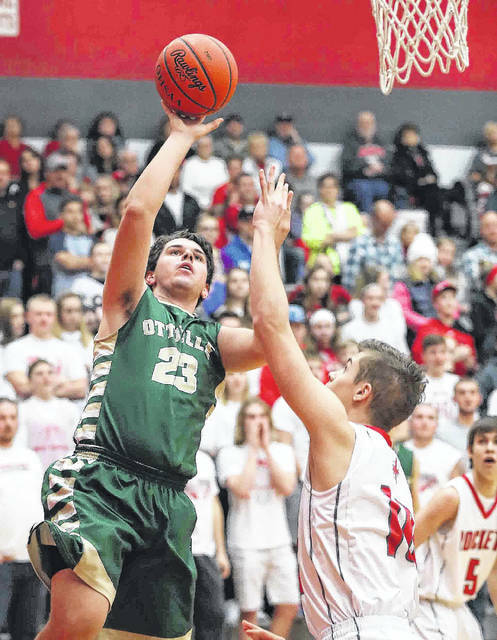 Nick Moorman had 18 points for Ottoville. Logan Kemper had nine points and 12 rebounds. P-G won the boards 28-25. P-G is 10-1, 4-0 in the PCL. Ottoville is 11-3, 1-3 in the PCL. The game came down to the third quarter when Johnson came back to the lineup. P-G started the quarter on an 11-3 run to pull out to a 30-25 lead. Breece got to the basket with a layup and McCullough sank a 3-pointer. Breece continually powered his way to the basket in the second half, either scoring, getting fouled or dishing off to a teammate for an easy basket. P-G finished it off by hitting 13 of 16 at the line in the final quarter. For the second half the Rockets were 18 of 22 at the line. Grant Murphy (eight points) was 6 of 6 at the line, while Johnson was 5 of 6. The Rockets led 11-8 after the first quarter. McCullough had six first-quarter points, with a 3-pointer for P-G. But at the 7:36 mark of the second quarter, P-G’s 6-foot-6 Johnson went to the bench with his second foul. He wouldn’t return in the first half and had four points. Moorman had nine points for the Big Green in the first half, as it pulled out to a 22-19 halftime lead. “This was a huge game for us,” McCullough said.